Usually MSDP (Multicast Source Discovery Protocol) is used for inter-domain (different BGP Autonomous Systems) multicast deployments. We can use this even within an IGP environment to provide resiliency for multicast deployment combine with Anycast. In anycast, same IP address (as RP) is advertised by multiple network devices into the network.Therefore when receivers join to particular multicast group, they will connected to close by RP based on the IGP metric advertised. Since all RPs advertizing same IP address sources can join to a different RP where as receivers join another RP (as all advertise same IP). MSDP comes into play in this situation to establish MSDP mesh between each RP. In this way even sources & receivers join into different RP, RPs talk to each other via MSDP they can establish Shortest Path Tree (SPT) between multicast source & receivers. So here is my test set up. I have changed the link bandwidth in order to create different IGP metric to RPs from source & receivers. Also I have configured the same IP address on Loopback 99 interface in both CME & WAN router which will act as RP. PIM sparse mode configured on given interfaces & EIGRP configured for IGP routing. First we will configure loopback interface in both routers (CME & WAN) & assign same IP address. You need to advertise this into your IGP domain. Now if you look at IGP metric from Source & Receiver to RP address (10.10.99.1) you would see multicast source connected switch (CAT2) goes to CME where as from receiver connected layer 3 switch (CAT4) prefer WAN router. You can simply verify this by telnet to 10.10.99.1 IP from these two switches. Now you have to configure RP address for your network devices. for the simplicity I will use static RP configuration (you can use any other methods like Auto-RP, BSR as well). Therefore “ip pim rp-address 10.10.99.1” needs to be configured on CAT2, CME, WAN, CAT4. Now if you source multicast traffic for a particular multicast group (226.6.6.6) from the source you should see (S,G) entry on CME as CAT2 preferred that over WAN for RP address. You won’t see any entry on WAN router. In this case receiver join to this group address from CAT4 that request goes to WAN as CAT4 preferred that as RP because of lower IGP metric. Now if you look at mroute for 226.6.6.6 while you are sending traffic to this group address you can see (S,G) entry at WAN. Flag M indicating source information known via MSDP. Now even if one of your RP went down, IGP will re-converge quickly & all network devices goes to next nearest RP. Still RP address will be same for them & no need to learn another RP address. 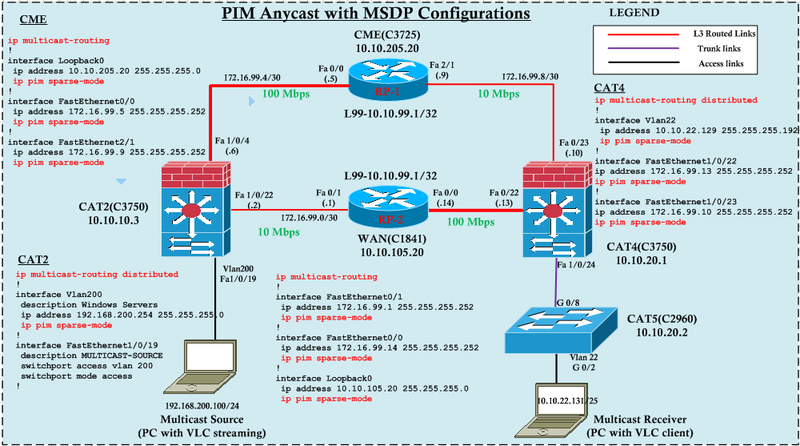 This is how you can achieve faster fail over with Anycast MSDP multicast deployment. 3. Wireless Multicast is not working – Why ?